Pula is one of the oldest towns in Istria. Town of rich history that dates back over 3000 years. Pula is the largest and most important sea port in Istria and the well-protected Pula Bay places it among the best natural harbors of the Adriatic. Pula is accessible by various means of transport and it is good to know that Pula international airport is located only 6km from the town itself. In Pula and its immediate surroundings there are many hotels, tourist resorts, camps and private apartments. 1. Park Plaza Arena*** - Recently completely renovated this hotel is located on Verudela, one of the greenest and most beautiful peninsulas Pula has to offer. Spacious and comfortable room, outdoor pool and the amazing location where hotel is placed (vicinity to some gorgeous both pebbly and rocky beaches) are just some of the reasons it quickly became a must visit. 2. Camp Arena Stoja*** - Hand in hand with Verudela, Stoja is another green and beautiful peninsula situated in Pula. The entire peninsula is home to Camp Arena Stoja where you will find lovely mobile homes that are located both in woods and close to the sea. An ideal pick for families or friends who want to spend their holidays in complete peace and quiet. 3. Turističko naselje Splendid*** - resort located close to the beach with beautiful apartments of various sizes and shapes hidden in the shade of Medierranean pine trees. Apart from accommodation itself the guest who stay there love the access to the outdoor pool which is located just above the sea on a cliff. Pula and its surroundings offer various accommodation options, as well as other facilities like the ones for sport or entertainment, different restaurants and bars and so much more. Pula is home to two bigger marinas as it becomes more and more beloved destinations for everyone who is into nautical tourism. A great place to stay right next to the sea is Hotel Park Plaza Histria**** and its adjacent annex bulding depadance Marina Wing****. Somewhat closer to Pula center located just above one of the most beautiful coves in Pula you will find Hotel Pula***. Amazing location and affordable pricing are the selling points of both hotel Brioni**, and Tourist resort Horizont**. In case you want to stay in the very center of Pula we recommend you do so in Hotel Galija***. Outskirts of Pula are home to the only national Park in istria, the Brijuni national park. Explore the islands and islets of Brijuni and stay in Hotel Istra*** or its annex buildings Karmen** and Neptun**. On the mainland quite close to Brijuni in a little town called Valbandon you will find Tourist resort Bi- Village**** with amazing apartments and mobile homes. If you decide to go glamping on your holidays don't miss out on Camp Arena One 99**** located in a village called Pomer. South of Pula on the tip of the Istrian peninsula lies a small village called Premantura. You might want to spend a few night in the apartments of the lighthouse Porer which is located on a small island just one kilometer from the shore. Just between Premantura and Pula lies village Banjole which is home to Resorta Centinera*** that offers both hotel rooms and mobile homes. In Banjole you will also find the popular Resort Del Mar****. 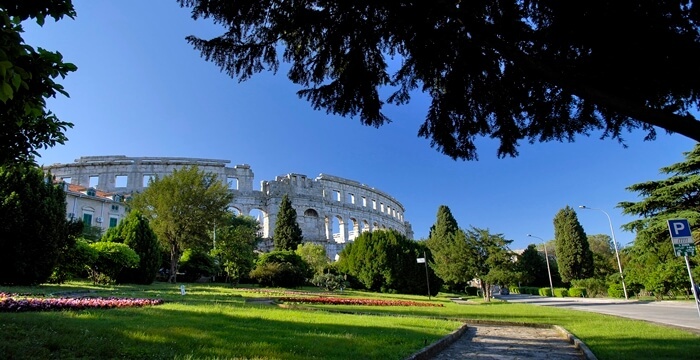 Pula shows its history at every step, from the ancient roman monuments like Amphitheater (Arena) which is also the symbol of the city, Arch of the Sergii and the Temple of Augustus to the Medieval and Renaissance buildings from the Venetian and Austro-Hungarian Empire times. We offer total 143 facilities.